Air coolers are one of the essential appliances and have gathered a huge popularity in the recent times. It is trending during the summer days in India. Places like Delhi, Rajasthan, Hyderabad, Gujarat etc; have very hot summer season and to stay alive and survive the hot weather, an air cooler is much needed. There are several different brands and types of room cooler available in the market and it is very difficult for a person to choose one among all. However, to choose the best air cooler depends on your requirements. You need to know how to choose the best cooler in India and for that here we have a detailed guide on that and also reviews on the top 10 best air coolers in India. What are the Advantages of The Best Air Cooler? These air coolers are best suitable for small and medium size rooms where there is humid temperature. They consume less space, less power and easy to manage because of their slim size and shape. These coolers does not produce noise when operating. The water tank capacity of these coolers are small because they are made to be used in small rooms. These desert air coolers are used widely in climate areas in big halls, offices or restaurants. They have larger water capacity as compare to personal air coolers. They consume more power because they are built for a large space and thus are larger in size. These coolers might be noisy because of heavy blower in it and large fan. These coolers are more able to spread air in every corner of the room where they are placed. These air coolers could be used in both outdoor and indoor purpose. Now if you have decided which cooler is of your use whether personal air cooler or desert air cooler. The next step is to decide which brand will fulfill your basic needs. These keys points listed below will eventually help you to buy best air cooler in the market available for you. The cooling pads are responsible for better evaporation of the cooler. Now a days companies are using honeycomb technologies which uses cellulose pads because they are thicker and provide better and longer cooling. There are aspen pads also available but better option is to go with honeycomb as they are thicker then aspen pads thus better and longer absorption. Deicide this factor on the basis of your requirement. Air coolers are based on evaporation technology, the water is converted into vapors which will lead to the drop in temperature of the room. The air coolers with huge water tank will give you more time for relief to refill the tank. You should choose a cooler with wider tank which will fit your everyday usage. A large room will evaporate more water thus will require larger tank, so desert air coolers of 31 to 50lts. capacity will be suitable if you have large room. Whereas if you have a small room or medium room a cooler with water tank capacity of 20 to 30lts. Would be okay for you. Airflow is needed to be checked if you go into deep because it lets you know that how much your cooler will throw air in your room in every minute. This is termed as CFM which you can calculate by dividing the cubic feet of your room by 2. The airflow depends on the type of fan of your cooler i.e. if it is a blower or fan. The fan produces low air pressure, used in large air coolers but they give large volumes of air also. Whereas a blower produces high pressure but low air volumes, so they are used in small air coolers. After this, decide for the factor that if they are providing speed regulators or not. There are cooler available in the market which comes with auto louver movement to ensure better air regulation in all directions. Air coolers, unlike A.C., are space consuming and this is the major drawback of the taking cooler. So companies nowadays are producing stylish and compact air coolers which will consume less space and are capable of making even large rooms cool. Companies like symphony have now started providing remote control functions which will let you operate the cooler from the place where you are sitting. You can control the speed, set sleep timer or you can switch it on or off. Air cooler are now capable of working with inverter also. Some of the companies have now started adding this feature to the devices and many of the models are already in the market. These coolers then are the best choice in the market if you face regular power cut off. Let's find out which one is the best air cooler out of these top 10 listed in this blog post. The Symphony Diet 50i Air Cooler is one of the best air cooler for you to purchase. The product comes with a mosquito net and dust filter. The mosquito net keeps mosquitoes away and the dust filter gives fresh air devoid of dirt particles, allergens, and other air pollutants. The product also has the capacity to cool a room measuring 42 cubic meters with the best result. The air cooler online works on a powerful and effective Dura pump technology that helps in preserving the life of the pump. The Symphony Ice Cube XL i Air Cooler has a capacity of 12 liters and is quite moderate to use for everyone! The product also has a powerful 16-inch blower fan which maximizes airflow reach and air throw. Apart from this, the air cooler online also features a mosquito net and a dust filter to ensure there is no harm in the air. It is built with durable, engineering grade ABS plastic to make the body last longer. You can indeed get a special treatment with eth Air cooler. The Symphony Diet 12i Air Cooler compromises of a great built body and also a good tank capacity. The product has a tank capacity of 12 liters which makes it great to use. The body of the air cooler online is built with durable, engineering grade ABS plastic. Apart from this, it has a powerful 16-inch blower fan which maximizes airflow reach and air throw. Definitely, the Symphony air cooler is a must buy for your needs. You can operate the product with a remote as it comes with a 7-hour timer. 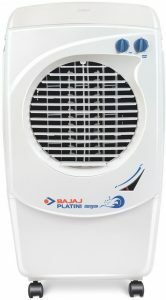 The Bajaj PC2012 Air Cooler is one of the best air cooler that you might wish to get. It has powerful airflow with air delivery of 2040 cubic meters/hr at peak and 1300 cubic meters/hr at an average. Apart from this, the product features ChillTrap Technology & four-way air deflection. Also, you can get a special blower control to adjust the wind blow easily. The air cooler is made of attractive, corrosion-free engineering thermoplastic material for durable performance. The cooler comes with 1-year warranty. It comes with castors wheels for easy mobility. The Symphony Diet 8T Air Cooler is great to buy for those who are looking to have a small space. The product is small and not for big commercial spaces. The tank capacity of the product is around 8 Liters and it comes with three-speed control settings. It features high-efficiency Honeycomb cooling pads. These pads ensure maximum cooling and low-pressure drops. This makes the product to be more competitive and also great for regular use. Apart from this, the Symphony Diet 8T Air Cooler has a good outline as well. 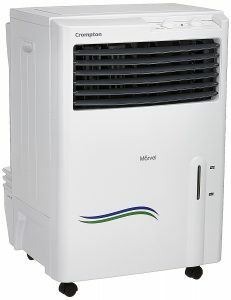 The Crompton Marvel PAC201 Air Cooler has a great air cooler review when you wish to purchase the best air cooler in India. The tank capacity is quite moderate and it is around 20 Liters. Apart from this, the product also features three-speed temperature controls for the best result. The air blow can easily cover a space of 150 square feet and it is a nice thing to get. The product comes up with a built-in ice chamber to keep the water cool when in need. The cooler provides powerful three side surround cooling. It has castors wheels for easy mobility. The Bajaj Torque PX97 Air Cooler is one of the top rated air coolers online for you to purchase. It is one of the best air cooler ranked by Bajaj. The tank capacity of the air cooler is around 36 Liters and it is indeed great to use. The product provides a powerful air quality which can be very helpful just when needed. The air throw is very powerful and it is nearly 30 ft. So it can cool down a big room or even a big chamber office space. The users can get a 1-year warranty on the product. The Symphony Diet 12T Air Cooler is ranked third in our list of the air cooler review. The tank capacity of the product is a bit low and it is about 12 liters. It is great to use in small rooms. Apart from this, the air cooler comes with 3 distinct speed options including high, medium and low. The product also has a Dura-pump technology for the best durability and also long lasting performances. Overall, the Symphony Diet 12T Air Cooler is a must buy for the budget-friendly buyers. The Symphony Diet 22i Air Cooler is certainly the most valuable under our list of air cooler price in India. 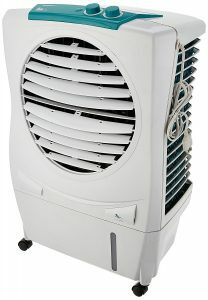 The product has a durable motor and also with a combination of a great price and air quality. This air cooler online has a capacity of 22 Liters and also a rate of higher air blow. Certainly, the product is very affordable and also the upgraded technology will help everyone. The product comes up with an ice chamber which boots the temperature down easily. The Symphony Hicool i Air Cooler is certainly the best air cooler in India that you can wish to purchase for your regular use. This air cooler comes with a tank capacity of 31 Liters and also with full function remote. Apart from this, the cooler also has a 3speed control which provides accurate air blow to all parts of the room. The product comes up with a 7-hour timer that integrates the best results for everyone. The settings enhance automatic room temperature. Now before you think of buying an air cooler for yourself, you need to know what it is exactly and what it does. Well! An air cooler is nothing but an electric appliance that provides cool air through evaporating the water you put in. Yes! Air coolers use the water that is stored in the tank present inside the device. It then filters the water an evaporates it and then supply the filtrate hot air and cooled it before realizing it to the environment. To give you an estimate, it cools down your room temperature to about 2-3 degrees Celsius. Now another big factor to consider is the climate of the place you live. Well! You should always buy the best cooler in India depending upon the climatic condition. An evaporative cooler is a true blessing for warm weather. Choosing the right brand is the key to get the best air cooler available in India. You need to do some research to find out a popular brand that sells air cooler. However, this article has top 10 best brands for air coolers to choose from. Now coming to one of the most important things to consider is the budget. Well! Before you think of buying anything or any product, you need to think about the budget you have. Set a budget in your mind that you want to spend and then chalk out for other features on that price range. You are bound to get the best product for yourself like this. While you think of buying an air cooler, then you must consider the very first thing that is the room size where you are going to use it. Now if you have a large room, then you need to look for room coolers having that much capacity to cool your room. However, if you have a small room, then a portable one can do the work for you. Cooler pads of air coolers must have a thickness around 90 mm to stem optimal performance. Remember, the thickness of pads is very important to get chilled air. Your selected cooler should have an automatic water control option that can show you the level of water in the cooler and thereby prevent water seeping out. Look whether your air cooler provides you with the remote control feature or not. Remote control devices will provide you free handling and you can control your temperature through an easy and operative mode. With remote control, you can control the speed of the fan. There are mainly two types of air coolers available- portable coolers and evaporative coolers. You need to buy a cooler depending on the climatic condition as well the size of your room where you are going to place it. Choosing the correct type of air cooler will make sure you get your room cooled evenly. Look out for some additional features that come with your air cooler. If you are paying a good amount for your air cooler, then you must look into for some extra features. If you stay in place too hot and humid as well as dry, then opting for an air cooler is the best option for you as it provides moisture to the air and makes it cool as well. ACs are quite expensive whereas if you opt for the air coolers, then it will fit within your budget. If you have a good budget, then you can surely opt for AC but if you want a budget option go for air coolers. Air coolers are quite popular as they are portable and also doesn’t emits any CFCs and other harmful gases. They are less power consuming and hence saves electricity expenses. It is easy to install and quite user-friendly. 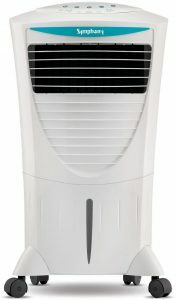 Best Buy- the Symphony Hicool i Air Cooler is certainly the best air cooler in India that you can wish to purchase for your regular use. This air cooler comes with a tank capacity of 31 Liters and also with full function remote. Definitely, it is the best choice for you to purchase when needed. Value for Money- the Symphony Diet 22i Air Cooler is certainly the most valuable under our list of air cooler price in India. The product has a durable motor and also with a combination of a great price and air quality. This air cooler online has a capacity of 22 Liters and also a rate of higher air blow. Hopefully, this article gives you a brief idea about the air cooler, how it works and what it is actually. Well! You need to research a little bit about the product you choose before opt to buy it. Don’t jump to a conclusion so easily and check out other customer reviews to know how the product has worked for others and every minute details. You can also choose one of the products from the above listed top 10 best air coolers in India.